Chain link fence is a durable, secure and low cost general fencing material that is widely used in a variety of situations including commercial chain link fence installation. It can fence in a yard, enclose a large parcel of property or secure a highly sensitive area. It is used at ball fields, playgrounds and race tracks. We’ve even used it to build caging for personal items in a basement of a condo. It commonly is made of galvanized steel wire but is also available with a colored vinyl coating. Its characteristic interlocking diamond pattern provides an unobstructed view through the fence. 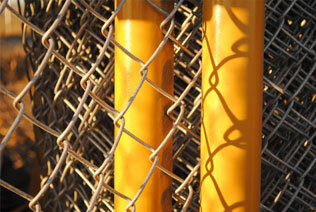 Chain link fence or chain link mesh is often referred to as fabric because the manufacturing process is called weaving. The Norwich, England, company Barnard, Bishop and Barnard is credited with being the first in 1844 to manufacture chain link fence with a machine. The steel was woven similar to cloth weaving machines. Commercial chain link fence installation is a lot different on a large property or highly secure area than a small backyard. L&C Enterprises-USA patented the first chain link fence dispenser in 1990 to help fence companies install a large amount of chain link fence. The Installink Fence Dispenser allowed installers to dispense 100 foot rolls of chain link fabric, greatly increasing the speed of installation. Until then, only 50 foot rolls of chain link were available that was installed by hand. The development of the Barbed Wire Dispenser patented in 2006 made it even faster to install a security fence by speeding the installation of tension wire and barbed wire on large industrial installations.